HEN OUR HOLY FATHER approved the centuries-old cultus of Hildegard of Bingen, and even more when he named her a Doctor of the Church, I had been thinking that I ought to get to know her better. Up till now, she has seemed to be the province (or the victim) of herbalists, tree-huggers, ex-clerical modernists, and suspiciously languid early music groups that dress up in faux medieval costumes to chant Hildegard’s lyrics. I wanted to know more about the real saint behind the myths, the mighty Benedictine abbess who received mystical visions, wrote copious treatises and poems, and corresponded with some of the great minds of her age. I chanced upon a reliable collection of her mystical writings at a used bookstore and snatched it up. Reading it the past few months has been an eye-opening experience as I learned of Saint Hildegard’s profound (and thoroughly orthodox) theological genius, her marvelous fluency with metaphors and imagery, and her blazingly intense intellectual concentration on the mystery of God, with whom she is obviously and passionately in love. Almost every passage I’ve read has left me muttering to myself: “Hmm, I wonder how I can work this bit into the next course I’m teaching.” She has such a way of putting things. Musical harmony softens hard hearts, inducing in them the moisture of contrition and summoning the Holy Spirit. So it is that those voices that you hear are like the voice of the multitude when they lift up their voices on high. For the faithful carry their jubilant praises in the singleness of unanimity and revealed love, towards that unity of mind where there is no discord, when they make those on earth sigh with hearts and mouths for their heavenly reward. And the sound of those voices passes through you in such a way that you understand them without being hindered by dullness. For whatever divine grace has been at work, it removes all shadow of obscurity, making those things pure and full of light that had been concealed by the carnal senses in the weakness of the flesh. When I read this, I had several thoughts in quick succession, amounting to a kind of “examination of conscience” for church musicians. If musical harmony is meant to soften hard hearts, induce contrition, and summon the Holy Spirit, is our music really doing this for the people in the pews? Moreover, are the faithful really engaged in “jubilant praises [of God] in the singleness of unanimity and revealed love”—is our music focused on the divine Majesty, in an idiom that fosters the unanimity rooted in revelation and leading to unity of mind, sighing for their heavenly reward? This sounds like a perfect description of Gregorian chant, which is surely the model Saint Hildegard had in mind. I do not know of a single piece of “contemporary church music” that embodies and expresses sighing for our heavenly reward, whereas the simplest Gregorian antiphon translates this transcendent longing into timeless music. Have the shepherds and ministers of the Church done everything they could to help the faithful understand the Church’s worship, or have they made a truce with the carnal senses and the weakness of the flesh (think “praise and worship” music), surrounding the sacred mysteries with shadows of obscurity and causing the spiritual progress of the faithful to be hindered by dullness? 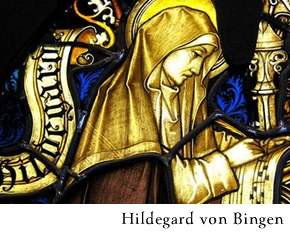 If Saint Hildegard were here today, what would she say of our music, our intentions, our standards, our aspirations?